Gain valuable skills and experience while giving back to the community! 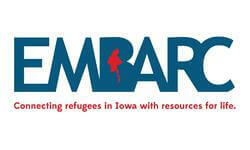 EMBARC is in search of a year-long AmeriCorps Communications Coordinator who will be responsible for managing the communications and marketing of RefugeeRISE through the website, newsletters, social media, and blog posts. Additionally, the position will teach best practices around social media, websites, and other helpful technical areas to the other RefugeeRISE host sites and members. Capture and store personal stories from RefugeeRISE host sites to use in marketing campaigns. Participate in monthly communications strategy meetings with volunteer communications committee, graphic designers, and other staff members. Teach best practices around social media, websites, and other helpful technical areas to other AmeriCorps members at RefugeeRISE host sites. Travel to host sites across the state (with paid mileage) to discuss their needs and capture personal stories. Paid professional development opportunities with options for mentoring from professionals. Receive monthly living allowance. ($7000 total)- Feb- August only Receive education award at successful completion of term of service. ($2950) Health care coverage (Health, Vision, and Dental) Access to a mental health hotline Post-service job referrals through networking with community and state partners. Must be U.S. citizen or U.S. national or a lawful permanent resident of the U.S.
Must have a high school diploma or GED or agree to obtain one before using the education award. Must pass a 3-point background check. We will share your profile and application with EMBARC. Before we can tell EMBARC to look at your profile and review your application, we need a few more details about you.